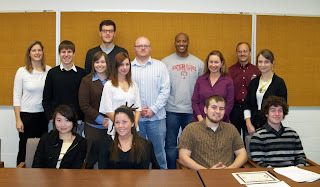 The Department of Geography would like to welcome the 2010 inductees into Gamma Theta Upsilon (GTU), Iota Chapter. GTU is an international honor society in geography founded in 1928. Members of GTU have met academic requirements and share a background and interest in geography. GTU chapter activities support geography knowledge and awareness. Standing from left – Sarah Blue (Faculty), Ryan Coomer, Shannon McCarragher, Jacob Kruse, Alicia Lisowski, Steve Hamilton, Ata Shakir, Christine Carrier, Andrew Krmenec (Faculty Advisor), and Michaela Freidrichova. Sitting from left – Siqin Wang, Tara Whippo, Trevor Edmonson (President), and Michael Williams (Membership Chair). Not pictured – Benjamin Peterson, Daniel Weldon II, and Michael Schuch.